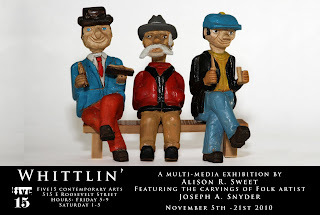 My newest exhibition at Five15 Arts is called Whittlin'. It is a multi-media show featuring the work of folk artist, Joseph A. Snyder. Joe is an unknown folk artist from Idaho. 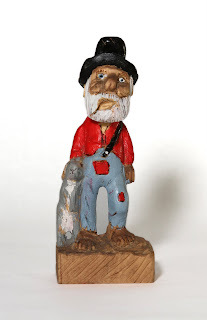 He started carving wood, as his main hobby, over 20 years ago in 1989 when he and his wife were retiring to the small mountain town of Idaho City. 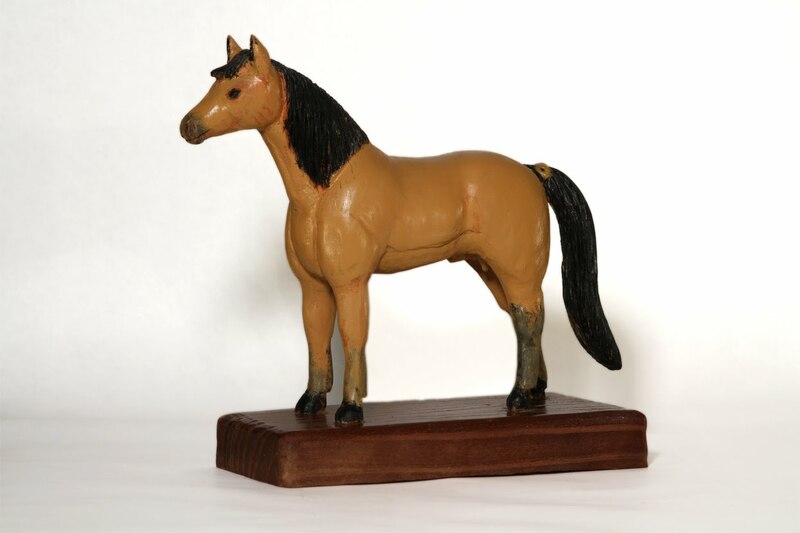 Prior to working with wood he had used a variety of other mediums. For example: he was an avid leather worker, making purses, belts and wallets for everyone in his family. He also was a painter, a rock collector, a handyman and made his own latch hook scenes. 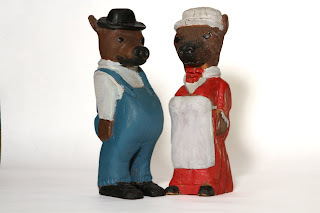 His carvings started with bears and boots and progressed into an entire array of people, animals, objects and canes. His first bear was made out of a 2x4 and was quite skinny. Joe teases , as he often does, "That the bear had a hard winter." 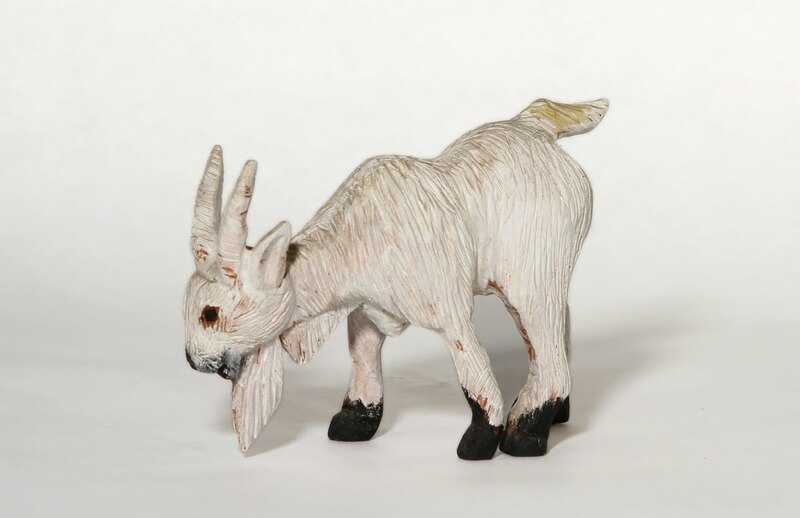 Joseph was a prolific craver creating hundreds of objects in his basement workshop and still carves today, at the age of 91, although at a slightly slowed rate. Joe Snyder is also my maternal Grandmother, I grew up, in Idaho City, visiting my Grandparents almost every Sunday. Thus, I was around his constantly growing collections of carvings as it developed. There were multiple Cowboys, moonshine makers and hobos, many based on stories from Ekalakah, Montana where my Grandmothers homestead was. My Grandfather is also quite the story teller so there were many stories told in conjunction with the various carvings. There are bears, birds, farm animals, some realistic and some from stories such as the rabbits from my Grandmothers favorite story as a child, Peter Rabbit. This is how I remember my Grandfathers carvings from childhood, a slew of brightly colored characters and animals with stories and fantasy to go along with them. I returned to their home for the summer of 2010 as an adult, with an art degree expecting to see things in a different light. Other, than a deeper appreciation of the skill and artistic commitment it took to create this large body of work, my perception of the carvings hasn't changed very much. I believe that the carvings are really rather amazing and extremely unique. There has always been an aspect of my Grandfather that was sorry that nobody, other than family and friends, ever saw his work. His home, stuffed full of his carvings have never really been shared. Due to my own gallery opportunities and my appreciation for his endeavors I decided to put on this show. Using his passion and creativity in conjunction with my own to create a hybrid presentation of his carvings. The show will be consist of framed digital prints of a selection of the carvings, a projection of a majority of his 300 plus carvings, a series of stop animations made with his carvings and a video documentary piece featuring Joe and his process. The Hound that Gets Around from Alison Sweet on Vimeo. This will be my second solo show at Five15 Arts and my third big show since graduating last May from Arizona State University. I help to co-curate the A.E. England Artlink gallery and have worked with various artists on their Phoenix projects. I was also awarded an emerging artist grant this year from Contemporary Art Forum via The Phoenix Art Museum. 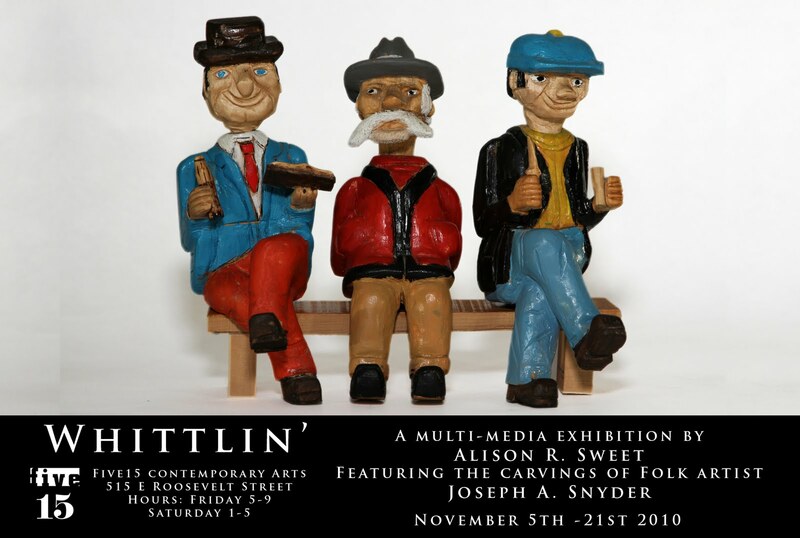 Whittlin' will open on November 5th at Five15 Arts. Five15 Arts is open Friday's 5-9pm and Saturdays 1-5pm, it is located at 515 E. Roosevelt Street in Downtown Phoenix. The show will be open from November 5th through November 22nd. Additional gallery hours can be facilitated by contacting me at Shoe Made Of Cheese at Gmail.